It may be very cold, but the open shelters Biotope designs at least afford some protection from the icy winds of north Norway. 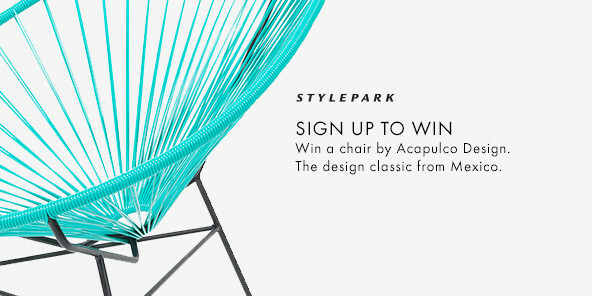 The three founders of Biotope architects share two great passions: architecture and birds. As a result they founded their own studio in north Norway, on an island in the Arctic Ocean that is ideal for watching rare birds. The architects at Biotope run what is possibly the northernmost architectural office in the world, namely in the extreme north of Norway, in Vardø. Vardø is actually little more than a piece of rock off the northeastern-most tip of the country, a good four degrees north of the Arctic Circle. Its 2,000-odd inhabitants are spread across the island of Vardøya and the bird cliffs round the island of Hornøy in the Arctic Ocean. Polar night lasts a good two months here, and a three-kilometer-long road tunnel is the isle’s only connection to terra firma; hard to imagine that the place has been inhabited for some 9,000 years, but that’s what the archaeological finds say. So how on earth did people survive here 8,950 years before warm functional clothing was invented? 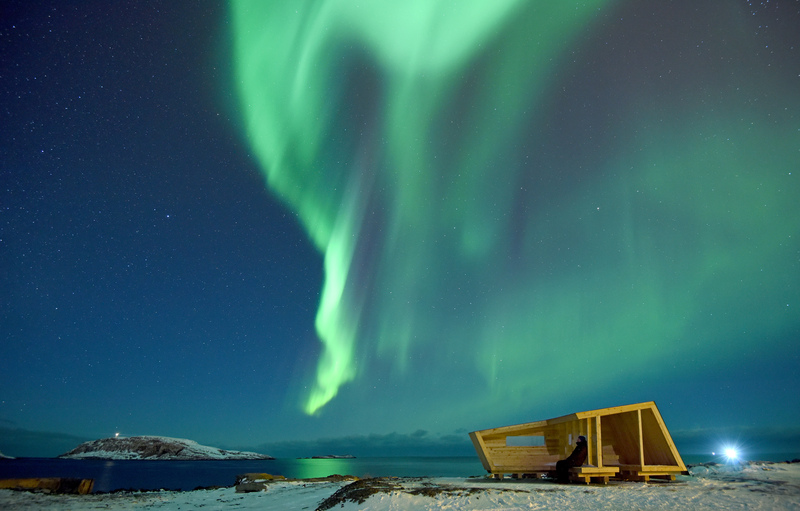 Dancing aurora borealis over the Hasselnes bird hide. Amundsen recalls having raved about birds even as a kid. The idea of turning that enthusiasm into a profession came to him in his final year as an undergraduate at the University of Bergen. There, he felt the thinking on sustainability did not go anywhere near far enough, with architects only interested in their new builds’ carbon footprints or energy consumption levels, but not in the fundamental relationship between humans and (harsh) nature. He therefore joined up with his two partners to found Biotope as a kind of nature protection architectural office. It takes a little imagination to establish an office in one of the remotest corners of the earth. Above all, Biotope has good links to the local communities and to private travel companies. It now acts as an intermediary between tourism (hopefully a growing industry) and the needs of nature and the birds – precisely in their breeding grounds they require silence and no outside disturbances. The architecture of the small bird hides that Biotope is specialized in designing is therefore always very simple and compatible with nature, the striking shapes derived directly from the spectacle of the harsh cliff world into which they are smoothly inserted. Take, for example, the hide they built looking out over the Kongsfjord in 2015. It rests atop the cliff like a large dark piece of wood and its large window peers down and out over the abyss. The small space is destined to protect visitors from the icy winds so that their hands don’t tremble too much holding the binoculars. In this way the small building achieves two things, as behind the pane of glass the humans remain hidden from the birds while at the same time it offers a superb view out over the nests. 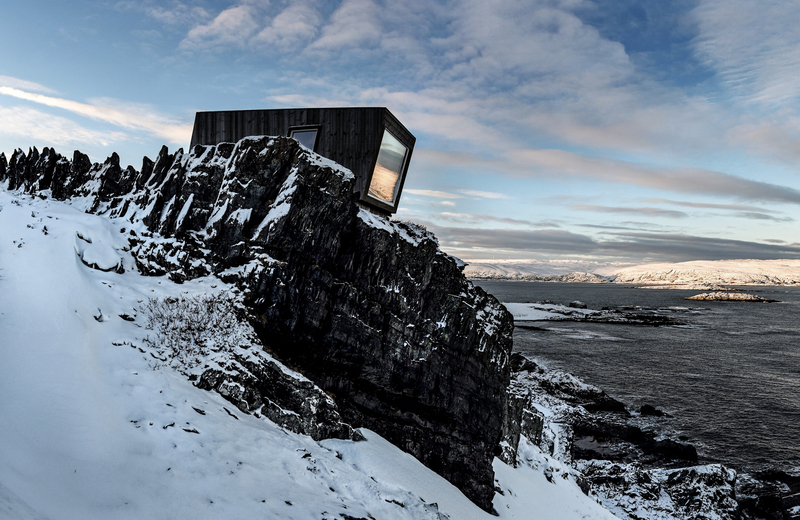 Superb view: The shelter is perched above the Kongsfjord like a piece of black wood. “We develop our hides and shelters based on the character of the location, sight lines and wind direction,” comments Amundsen. 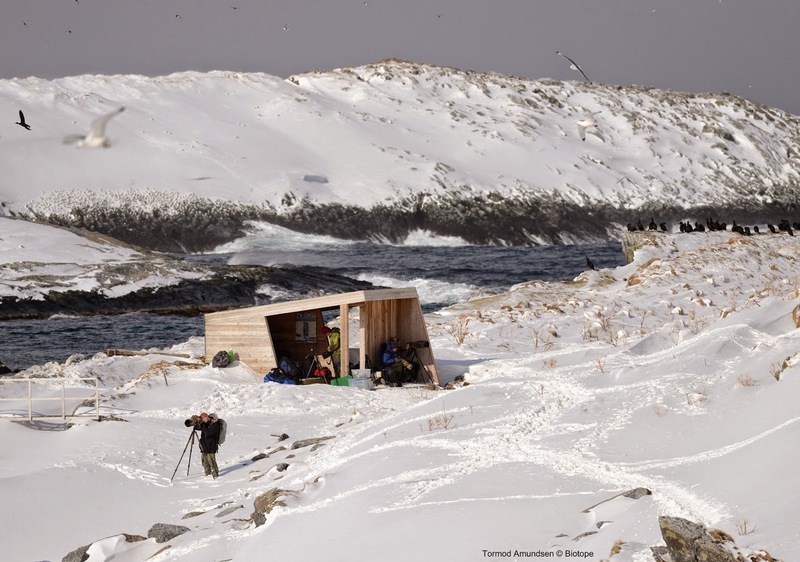 “They carefully balance the need for visibility in order to attract and concentrate human activities, the practical requirements of the birders, and sensitivity to the needs of the birds.” The miniature houses are thus kept as plain as possible, usually a hide built around simple seating and protected from the snow and wind by two, three or very occasionally four walls. They are by no means intended for overnighting. “Architecture,” Amundsen continues, “is a tool to protect and promote birds, wildlife and nature.” After all, if people have a greater feel for the rough and wild landscape they will automatically do more to protect it. The Hornøya bird cliffs are one of the main attractions in Varanger. With minimal interventions such as this open shelter, Biotope sets out to improve the infrastructure and also protect the birds. The architectural materials respond to the surroundings: Biotope chooses wood for most of its hides, opting for concrete for the harbor shelter in Vadsø..